This book went fast, but not fast enough. The headache I had when it was done was unbearable. Instead I got a whiny, self-centered, “the world is out to get me”-complex sixteen-year-old girl who acts more like she’s eight. Maddy Starr is the epitome of annoying. You think Bella Swan is bad? Wait until you meet this girl. No one understands her, everyone’s out to get her; she hates the world, yada yada. I think my first sign that this was going to be bad should’ve been the things not even in the story. 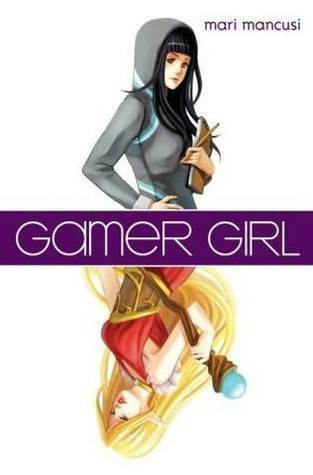 For example, the blurb: “ZOMG, it rox to be a gamer girl!” Or the dedication of the book: “To all the irl gamer grrls out there who totally pwn the boyz. Hawt chix0rs FTW” I swear, it was the cover. It was the cover that pulled me in. This book represents 3 hours of my life I’ll never get back. When I read the first page, I was faintly amused. I didn’t think it would be bad. By page 3 I liked Maddy less and less. Maddy is a city-girl who’s just moved to a small suburban area after her parents’ divorce, and this starts on the first day of her new school life. Which...well, you’ll see. The banter that’s shared between Maddy and her friend Caitlin on the third page is so generic I felt like I was overhearing a conversation between grade schoolers. I love how Mancusi put in words like damn and hell to make it seem more YA. She even capitalizes it so it reads like “DAMN”! All the brand names in this book... Agh. By page 7 I’m introduced to Maddy’s nickname for those who where Abercrombie—or, Aberzombie. Creative, right? Hmph. By page 9 Maddy started to show her true colors—her “no one understands me” personality. Her grandmother insists she wears something other than what she’s wearing to school, to which Maddy protests, and less than ten minutes later ends up wearing a unicorn outfit. I don’t know how many sitcoms the author of this book watched before she wrote this, but I know that none of my grandmothers or any of my friends’ grandmothers is this uninformed. Also, her grandmother walks her into the school to sign her in, because it’s not as though Maddy has been humiliated enough. So we’re met with another sitcom-like scene as the whole freaking sea of students parts in the hallways to allow the head Aberzombies through, the rulers of the school. Yeah, this school has cliques. I go to a school about the size of Maddy’s, or at least I seem to. We don’t have cliques. Everyone hangs out with everyone. It doesn’t make any sense to me in this book. It’s too generic. It’s like this book was meant to be a screenplay for a sitcom and ended up as a ‘work of literature’. Ahh, the Aberzombies. You know, I’ve never heard of bullies who were so open in their bullying. For me it was always subtle. You know, spit wads in my hair or stolen items. Sure, this happens to Maddy, but that’s not enough. It can’t stay realistic. Nah, she has to get bullied personally in front of her own grandmother...who ensues to embarrass her and doom her to a school life of horror. Sigh. Instantly these Aberzombies are dubbed the Haters, capital H.
What I mean to say is that... Okay. Maddy and her mother. Her mother is always guilt tripping her—her own daughter! I’m sorry, what? Then Maddy and her sister. Where Maddy acts like she’s eight, her sister acts like she’s four and goddess of the world. Maddy and her grandmother are kind of in the realm of whatever. Maddy and her father relate, but her father is a neglectful SOB. You get the idea. Maddy gets a videogame called Fields of Fantasy and creates her new alter-ego, Allora. I hoped it’d get better here, but it just got worse. Maddy, a girl who watches anime and reads/draws manga, doesn’t know what roleplaying is. That’s when I lost hope for this story. Not only was she the kind of girl who takes crap and blames anyone except herself for it, she’s also brainless—to add to that further, after one hour of playing with a guy named Sir Leo, she’s in love with him. Fantastic. At first, I had no problem with this. But it nagged me until I realized what it was. “Lame kids in a dinky little suburban town” and “I had bigger plans for [my life].” Maddy Starr, you are a city girl. You have absolutely no right to judge anyone from a small town because obviously from the beginning of this story you were the snob of the story, the one who saw yourself as better than anyone else. You have bigger plans for your life? Oh, wonderful! You mean becoming a manga artist? Oh, that makes sense, since the laws of realism are completely null in your world. Not only do you win a contest, but you get the guy, get a bunch of friends, get a bunch of prize money, a publication offering; you even get the e-mail address of your favorite manga artist! I hold a deep loathing for this book, its characters, its unrealistic storyline, and Maddy’s whiny voice. I wish I could refund this so badly. This is the most anger I’ve ever held for a book. I got this book expecting an easy, loveable read, and I ended up getting so angry. By the end I so wanted to introduce Maddy to Flandre Scarlet. For all the anime and manga she loves, she apparently has never heard of her. Flandre would probably love to introduce herself with a Sixteen-Claw-Flame-Wall. I want to see what you rate The Casual Vacancy (if you read it). I'm literally antsy and so frustrated right now because I have to wait a few more hours to buy it.... I'm checking Mugglenet and Amazon reviews over and over.... this is not good for me. Ugh. Whoa, that doesn't sound good. |:> If I get my hands on it I'll let you know what I think. But from what you're saying I'm probably going to get it from the library, not buy it. Well, yuck. That sounds just awful. And I hate when a book leans that heavily on pop culture references; it's really alienating for people who don't want to dedicate the brain space to keeping up with all the "hottest" names of brands and celebrities. Moreover, characterizing someone as a lip-glossed Barbie says less about the person than it does about the lack of the name-caller's imagination. So sorry you had to endure this aggravation. I feel like I should send you a condolence casserole. ...Or hey, someone could send me one; I haven't lunched yet.